My children love Minecraft. They could play for hours (and I must admit that they often do) and although they are full of their own ideas they love it when I come up with suggestions for them. 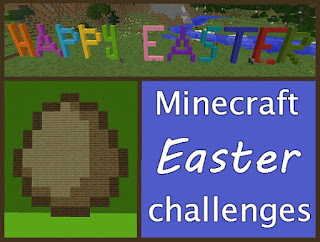 With the Easter holiday approaching, with their help I have put together a list of Easter themed Minecraft challenges to keep any Minecraft fans busy! * If you have your own world in Minecraft that you play in regularly, decorate it for Easter. Use pastel coloured blocks and plant lots of Spring flowers. * Build a large Easter egg with something inside it - maybe a chick or some Easter sweet treats. * Come up with an Easter egg hunt for another player. There are lots of different ways that you could do this. 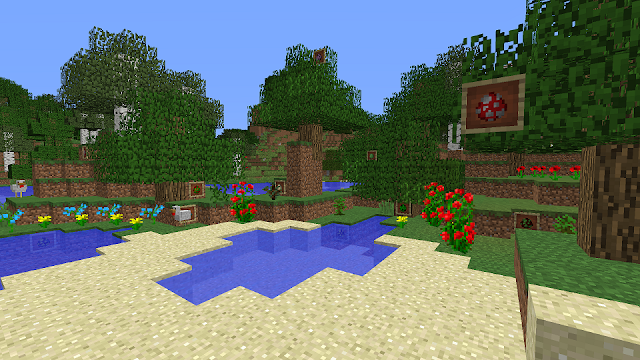 The most simple would be to hide Easter eggs around your world. My son created the egg hunt below using item frames to display different coloured eggs - I've been told that there are ten to find in this picture, but I can't spot them all! * Another Easter egg hunt idea is to create a trail following clues, similar to one that you might make for children around the house. It's best to have a defined area for the hunt so that the player doesn't stray too far. You can use signs to write the clues, and hide the eggs inside crates. * Build an Easter trail, where a fellow player can follow a path through trees or buildings, spotting eggs and flowers as they go. * Build an Easter themed train or boat ride which takes the user through an Easter themed wonderland. * Come up with the best way of making a 3D egg and then create different versions using different colours and patterns. I hope that you enjoyed this list and found something that inspired you to do some Easter creating in Minecraft - if you have any other ideas I'd love to hear them! You might also like my list of Minecraft Christmas challenges.